These "theories" of how the tank works are crazy. The fuel can get everywhere in the tank without isolation, thats for sure. I don't believe this pumpiing stuff at all. As for mixing before or after you fill, this is basic CHEM 101 stuff. The 2-cycle oil and gas are both Hydro carbons and 100% compatible. Surely they mix together all on there own at 250:1 ratio or leaner. There can be no "hot spots" of concentrated oil/gas except for the first moments when they meet. Who thinks otherwise, I mean Come-on fella's. Drive it and that's what works! Isn't there is a jet pump in the tank or whatever they called it. Even with the lack of return line, the excess fuel from the pump will have to go somewhere creating its own fuel mixing mechanism in the tank all the time. I often put in the 2cycle oil after a full tank filled up when my bottle is empty at the gas station. I woudn't be worry about it; those oil mixed with the fuel pretty well in those low ratio. Last edited by seikx8; 10-26-2006 at 06:01 PM. Sorry for reviving this thread, it's been going on in my mind. 1. I premix every 4ml for 1liter of gas (as suggested), but i dont daily drive the 8, maybe once or twice per month, i pour the idemitsu premix first before filling up. my concerns are, if the car sleeps for a month, will the 2 stroke oil separate itself from the gas in the tank ? if yes, will it be dangerous/bad? I doubt it will separate or stratify but, even if it does, it should mix pretty quickly at idle. A healthy fuel pump pushes more fuel than the engine needs. The pressure regulator routes the excess fuel back into the tank. In the process, the fuel passes by a venturi system that draws fuel in from the passenger side of the tank. Mixing is a byproduct of this design. If you're extra concerned, turn the key to "Run" but don't start. This turns the fuel pump on to prime the fuel system. Since the engine is literally using zero fuel, it will start mixing. I don't know how long the pump runs during priming but you can turn the key on and off a few times to make sure. Nothing to worry about. The salt will separate in the ocean before premix does in the fuel tank. meh premix. I just put gas in mine and it runs damn fine, like 99% of the other rx-8 owners. has anyone actually tested this to make sure or it’s all based on Joe Shmoe’s THOUGHTS? The solubility of one petroleum solvent in another petroleum solvent probably doesn't change very much as a result of the base stock. Maybe if there were a difference in hydrogen saturation but the refining process usually takes care of that pretty well (minimizing aromatic content is usually a design intent with petroleum refining catalysts). To extend Loki's analogy, the difference in solubility between synthetic and natural salt in the ocean would be greater than the difference between synthetic and dino 2-stroke in gasoline. Your comment about synthetic 2-stroke oil not mixing with diesel got me searching. I can't find any actual evidence that this is true. I'll have to try this at work. I have some Lucas synthetic 2-stroke and I work with petrochemicals in the diesel range every day. Best way for you to see that test would be to put some gasoline into a clear container and add an appropriate amount of 2-stroke. Mix thoroughly and wait for it to separate or stratify. Don't forget that these kinds of tests are easy to accomplish and you don't need special equipment, training, or facilities. Just do it in a well-ventilated area and pay very close attention to all potential ignition sources. Last edited by NotAPreppie; 01-10-2019 at 06:45 AM. thats exactly what I plan on doing, with a big clear jar. Simply pouring 2-stroke oil into a container of gasoline or diesel without mixing will not result in a mixed solution. They will naturally stratify based on density. This is perfectly normal and true of organic solvents like oils and fuels as well as water-based solutions. 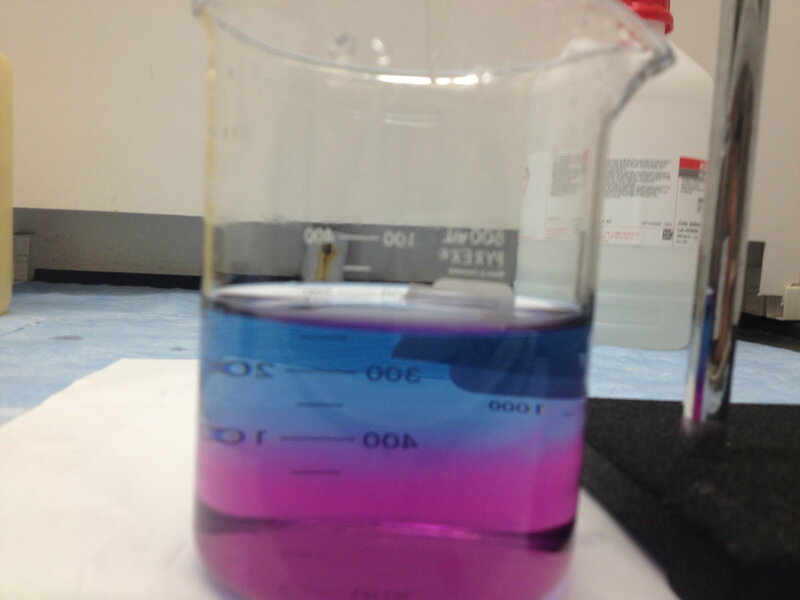 Here is a photo I took when teaching an analytical chemistry lab. 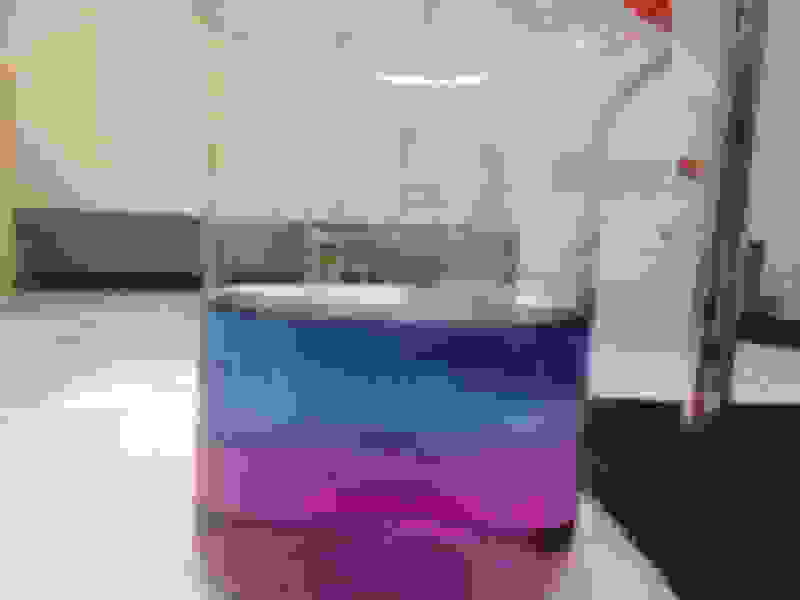 The top layer is deionized water with the indicator hydroxynaphthol blue (turns pink on presence of dissolved metals). The bottom layer is tap water with the same indicator. There is no other pair of solvents that are more miscible than water and water. Notice how they stratified? Let me repeat this: pouring water into water resulted in two layers. Hydrocarbon liquids will do the exact same thing. You MUST mix the two or your test will be completely invalid. Add both components to the container. let it sit undisturbed and check back after a few minutes, then a few hours, then a few days. Extra credit for calculating the amounts needed for reasonable ratios (the more oil you add, the more likely it will be that it separates or stratifies). Double extra credit if you setup several tests at once using 2-stroke oils from different base stock as well as both gasoline and diesel. Source: I'm an analytical chemist in the petrochemical industry. Last edited by NotAPreppie; 01-10-2019 at 09:47 AM. Yea but the mix thoroughly concept doesn’t apply to the gas tank. We aren’t able to pour the Lube and gas and then shake it violently to insure 100% mixture and even distribution. dump a few ounces into a jar and carefully pour in a gallon of gas. This will mix it as best as it naturally will in the gas tank. No shaking or anything extra. Then I want to see how long it takes before it separates. My RX-8 is driven daily but still takes a week to burn thru a tank. Then I can fill it up and it can sit for WEEKS. I’m concerned with the Pre-Lube separating and not giving the full benefit once I start driving it again. Currently i try to leave it with an empty tank, so when I start it up after a week or two, I go and add fresh gas and Lube. Seems to make the most sense to me. Last edited by Fijibluefg2; 01-10-2019 at 11:43 AM. The fuel pump operates by supplying an excess of fuel. Once max pressure is reached, the pressure regulator diverts fuel back to the tank. The path back to the tank takes it past a venturi that draws fuel over from the passenger side of the (saddle-shaped) tank. The pump runs as long as the car is running so it’s constantly mixing the fuel. Last edited by NotAPreppie; 01-10-2019 at 12:39 PM. I know some premix doesn't work well with ethanol fuel, so could be the same problem here. Again, where are the data to back that up? TBH I am just as curious as you are. Not that I use ehthanol fuel. If that’s the case (the Venturi effect mixing the fuel ALL THE TIME) then obviously my concern of the premix Lube separating isn’t really a problem then. Once the car is started and driven, the fuel pump will cycle the fuel around and mix whatever separated, correct? Yes... it's not an issue.